The long-awaited test lasted almost four hours, with the A380 circling the Bay of Biscay before returning to base. Thousands of aeroplane enthusiasts clapped and cheered as the twin-decked, four-engine "superjumbo" made a flypast before landing. Speaking after he landed the plane, test pilot Claude Lelaie said the flight was a "milestone". "You have seen a lot of ground tests, a lot of wind tunnel tests, simulators - for the first time you can see all the systems working together in the real world in the air," said Mr Lelaie. Jacques Rosay, who flew the A380 during take-off, said the plane behaved "immaculately" and that as a pilot "you handle it like you handle a bicycle". 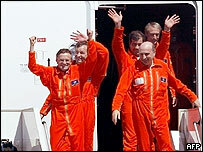 France's President Jacques Chirac called the test flight a "total success". "A new page of aeronautical history has been written," he said in a statement. "It is a magnificent result for European industrial cooperation." The A380's maiden voyage was powered by four Rolls-Royce Trent 900 engines, which were designed specially for the superjumbo. 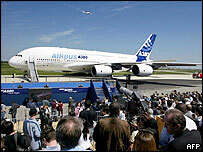 Arch-rival Boeing has instead chosen to focus on mid-sized long-haul aircraft such as its new 787. The US firm congratulated Airbus on the successful test flight, but added that "the A380 is a very large aircraft for a very small market". The A380 - designed to carry as many as 840 people between major airports - took off from its production site in southern France just after 0830 GMT. It had returned by about 1225 GMT, and touched down with a small puff of smoke from its wheels. Most of the testing was carried out at 10,000ft and within 100 miles of Toulouse, said Peter Chandler, deputy project pilot for the A380. During the flight, there was a live satellite feed of data which was monitored by a team of experts on the ground, Airbus said. Taking no chances, the crew had been equipped with parachutes. A handrail had also been fitted, leading from the cockpit to an escape door. 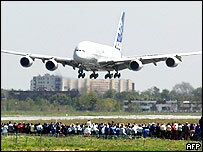 More than 50,000 people watched the take-off and landing, many of them sitting on the grass banks that line the runway. The historic flight was also broadcast live on television and thousands watched via a giant screen in Toulouse's main square. Pilots will then have to push the plane far harder than they did on Wednesday, testing for extremes of speed, altitude and temperature, experts said. The A380 project has had its share of problems.